The Aniol (pronounced “On – yo”) is our “BIG CHOPPER”. Made of O1 Tool Steel and hardened to a 56-57, this knife is all you’ll need to do every job from splitting pieces of firewood to killing a wild boar. 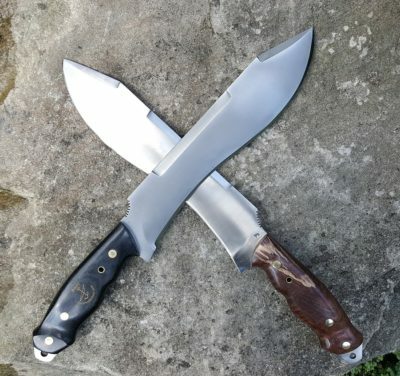 This knife was also designed by Tom Laskowski with the purpose of being carried when an ax is unnecessary but a small knife is not big enough. 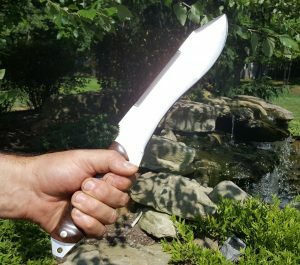 Its slight “drop tip” design was developed from the martial art theory of “punching through an oponnent”. The tip of the blade hits before the user expects to make contact thus causing them to chop further through the target, yielding more power with each hit.